This image of a large hill in Marte Vallis has numerous dark- and light-toned streaks along its slopes, showing a variety of characteristics observed in other areas with these features. 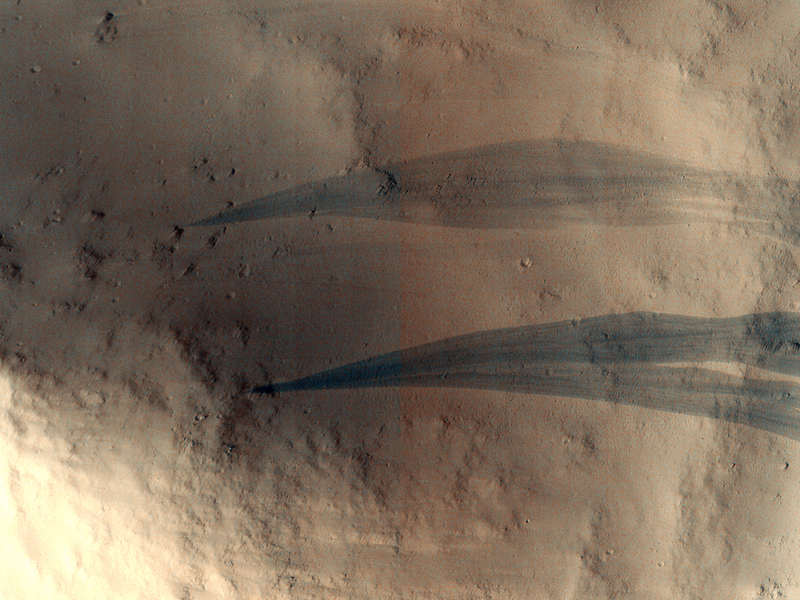 For example, several dark streaks have formed "fingers" at their end points. Their formation may be due to the material "feeling" the roughness of the ground as it reaches shallower slopes near the base of the hill. The dark streaks also appear to travel over many obstacles along their paths, such as impact craters, small boulders, and rock outcrops. This indicates that the slope streaks have sufficient momentum and energy early in their descent downslope that they are not affected by such features or the ground. The slope streaks also do not start at a common elevation along the sides of the hill, suggesting that they are not related to any particular layer(s) of material. Dark slope streaks are thought to fade over time by deposition of new bright dust on top of streaked surface. The presence of light-toned streaks relative to their surrounding darker-toned surface is particularly interesting. Scientists have wondered: if dark streaks fade over time by deposits of new dust, then how can there be light-toned streaks? Does this mean light-toned streaks are formed differently? Are the materials of a light-toned streak different from dark-toned streaks? Slope streaks have been discovered and studied since the early Mariner and Viking missions to Mars in the 1960s and 1970s. Scientists are hoping to resolve some of these questions using HiRISE images with its high spatial resolution compared to these previous Mars datasets. This is a stereo pair with PSP_003926_1915.